Miramar may well be best known to the general public as the setting for the famous 1986 movie ‘Top Gun’ but for the aviation enthusiast, it is home to one of the largest naval aviation bases within the United States. Currently home to the 3rd Marine Aircraft Wing of the US Marine Corps, the Flying Leatherneck museum on the north edge of the base is the only museum in the world dedicated to preserving the history of Marine Corps aviation. 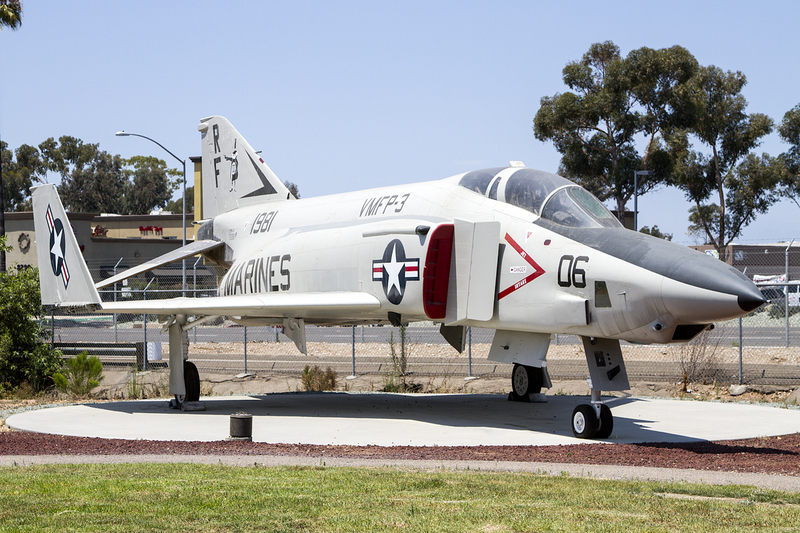 The Flying Leatherneck museum is situated on the northern edge of MCAS Miramar, approximately 30 minutes north of San Diego on the west coast of the USA. Although officially on the grounds of the airbase itself, it has its own entrance and perimeter allowing public access to the collection which opened during 1997. It is important to note that if using a satnav device to navigate your way there it will most likely try and route you through the main entrance of the base itself where you will be promptly turned around by security. Instead, it is much better to use an address on Miramar road as a waypoint (such as 8604) where you should not miss the museum which is clearly visible. Upon arrival you are met with a small collection of aircraft situated outside the main museum area which houses some of the ‘overflow’ of examples that has built up over the years. From the carpark, you immediately enter the only building on the site which houses, as well as a large shop, a number of Marine Corps exhibits ranging from the history of aviation in the Marine Corps to award trophies and female aviators in the Marine Corps. Unlike many others, entry to the museum is entirely free however a donation box for those that wish to help the museum raise funds for an entirely new building to house the collection is present. The volunteer team at the museum are all highly knowledgeable and very friendly giving advice on what to see and available facilities. Also available are a number of quiz’s aimed at children of varying ages although the silhouette recognition sheet has the potential to cause even the hardened enthusiast trouble! Walking through the building and out of the back door takes you to the bulk of the aircraft on display. All aircraft are kept outside with only a single example under a protective shelter. Access to all of the aircraft is easy with no ropes to be seen allowing visitors complete access to the collection. 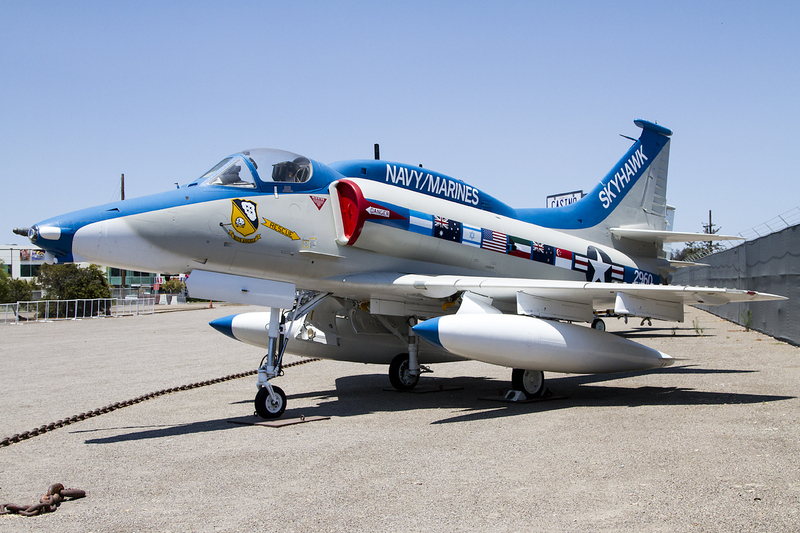 During the build up to the MCAS Miramar airshow, traditionally held in October, it is likely that some aircraft may be missing from the museum as a number are taken into the show itself to be used as static display items. Whilst the museum is technically on the grounds of the airbase itself its location is a considerable distance from the runway. Therefore, whilst the noise of based F-18, KC-130 and MV-22 can be regularly heard, any sight of them is normally very much in the distance. 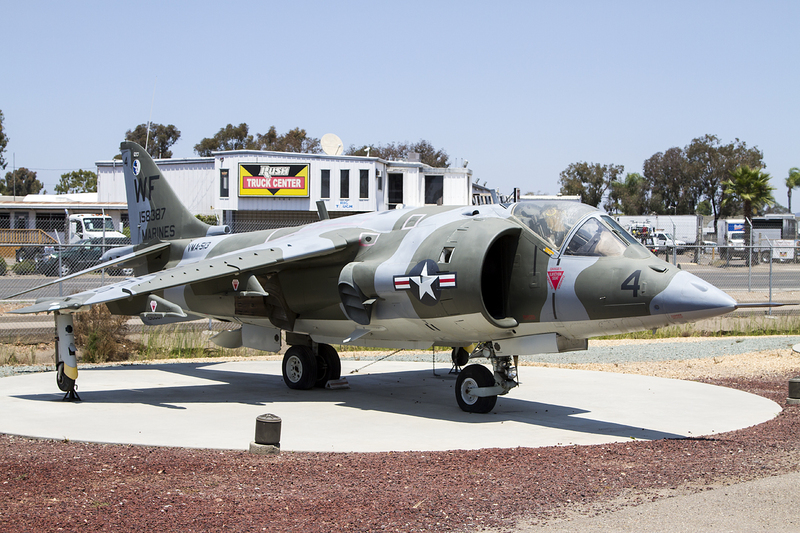 The museum is home to around 30 aircraft and covers Marine Corps Aviation history from World War II to the present. Whilst none of the examples are in airworthy condition some of the collection is moved into the base for display during the annual MCAS Miramar Airshow. Hawker Siddeley AV-8C (158387) – Originally built as an AV-8A in 1971 the airframe was converted to AV-8C specification in 1979. Shortly after, it joined NASA’s Ames Research Centre at Moffet Airfield as N719NA where it spend the 80’s conducting research related to V/STOL capabilities. Joining the museum in 2008 it was repainted from its white and blue NASA markings to its original camouflage scheme in 2011. McDonnell RF-4B (151981) – Released into service in 1965, this photo reconnaissance airframe spent its active service life based at MCAS El Toro firstly as part of Marine Composite Reconnaissance Squadron 3 (VMCJ-3) before being transferred to Marine Tactical Reconnaissance Squadron 3 (VMFP-3) which is the scheme the aircraft is displayed in. The aircraft is one of 46 of the type that were operated by the USMC. Bell 214ST (28166) – This helicopter is one of 100 Super Transport models built by Bell and was purchased by the Iraqi Air Force during the 1980’s. In February 1991, during an operation by elements of the First Marine Division at Kuwait International Airport, this example was captured in pristine condition. After shipping it back to the US, it was presented to the Third Marine Aircraft Wing as a token of gratitude for support provided during Operation Desert Storm. 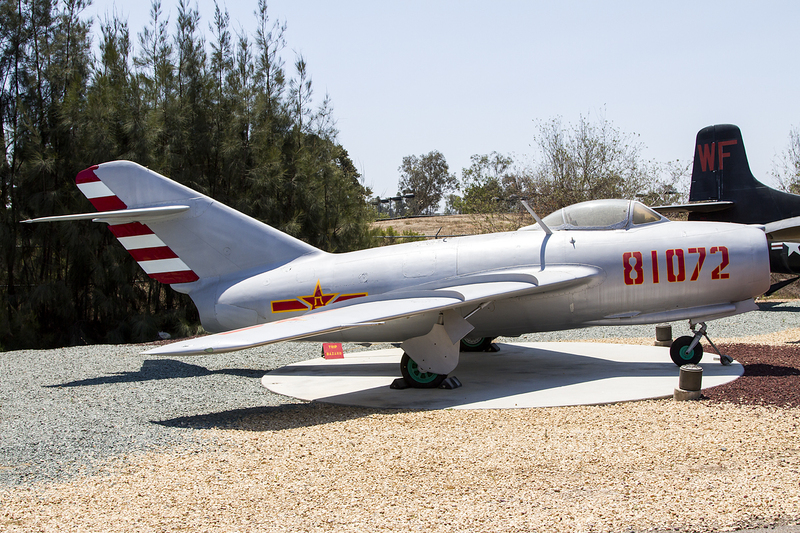 Mikoyan-Gurevich Mig-15 (80172) – The only aircraft in the collection that is built outside of the US, the Mig-15 may not have been a Marine Corps aircraft but represents an important era of corps aviation during the Korean War. This particular example was originally Russian built and was damaged in combat during that war before it was repaired in China and re-designated a J-1. It was acquired for the museum by US Army Silver Star Korean War veteran Warren Sessler from the Chinese Aviation Museum near Beijing in 1988 and now sits alongside one of its wartime adversaries in the form of a Douglas F3D Skyknight (124630). Boeing CH-46D Sea Knight (154803) – Developed during the late fifties and entering service with the Marine Corps in 1964, the Sea Knight provided medium lift transport capability along with SAR and CASEVAC roles. The museums example saw service during the Vietnam War where it participated in Operation Frequent Wind – a mission mounted on 30th April 1975 to evacuate the US Ambassador to South Vietnam, Graham Martin, from the Embassy in Saigon whilst North Vietnamese forces overran the city. Other fixed wing aircraft include early prop trainer examples with a North American Aviation SNJ-5 Texan (90866) and Beech T-34B (140688), a matt black Vought F4U Corsair (122189), a desert schemed North American Aviation OV-10D Bronco (155494), a further three McDonnell Douglas Skyhawks with A-4C (148492), A-4F (154204) and TA-4J (158467) examples and not one but two McDonnell Douglas F/A-18As (161749 and 163152). As can be expected with a museum dedicated to a force heavily reliant on rotary assets these are also well represented with a Bell AH-1K Sea Cobra (157784) and UH-1N Huey (159198), Sikorsky UH-34D (150219) and the imposing Sikorsky CH-53A Sea Stallion (153304) amongst the collection. As all the aircraft are kept outside, the photography opportunities are vast. The aircraft are well spaced out giving a range of angles to shoot from and the lack of rope restricted areas allows plenty of free movement to find the correct spot. Due to this it is unlikely that most people would require a lens wider than a typical 18-55 ‘kit’ lens. Lighting is unlikely to be an issue for most visits given the amount of sun that is seen in California although, being outside, sun position can cause a few issues early in the morning if the sun is still low. Combined with a number of the aircraft in a white US Navy paint scheme, the strong lighting conditions can easily lead to overexposure. To the north of the museum is a busy road and numerous retail outlets which can cause problems with the backgrounds of some shots especially with some of the large advertising signs. However, with careful positioning and waiting for a gap in the traffic, the majority can be kept out of shot. When looking south however only a chain link fence and bushes form the background obscuring the airbase behind it. For those wanting shots inside the building, conditions are expectedly tougher. Lighting and space are minimal giving difficult conditions to shoot in. A fast, wide angle lens is certainly recommended for this although high ISO may still be required as the glass cases used to house the display items may cause glare from a flash. 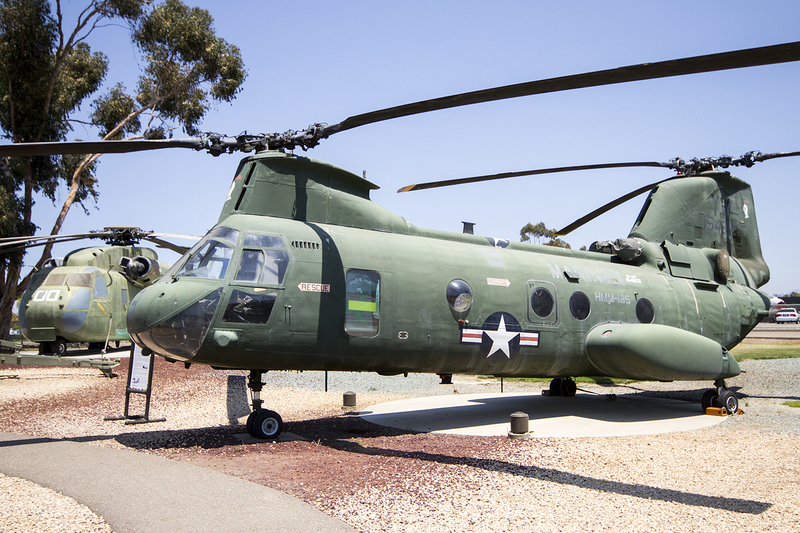 The Flying Leatherneck museum offers a unique collection of Marine Corps related aircraft and artefacts that can be seen nowhere else. Having the entire aircraft collection outside makes for some excellent photo opportunities however it is evident that the hot and dry Californian conditions take their toll on the aircraft. Whilst the museum is seeking the funding for a new building that would house the collection inside and better protect it, some of the charm may be lost but it is the preservation of the aircraft that must come first. Along with friendly, knowledgeable staff and free entrance, this museum has to be on the ‘must do’ list for any enthusiast. The author would like to thank Major General B.G. Butcher (US Marine Corps, Retired) and Colonel Ken Tollefson (USAF, Retired) for their assitance in providing background information for this article.